Which Vegetables are Good for Roasting? 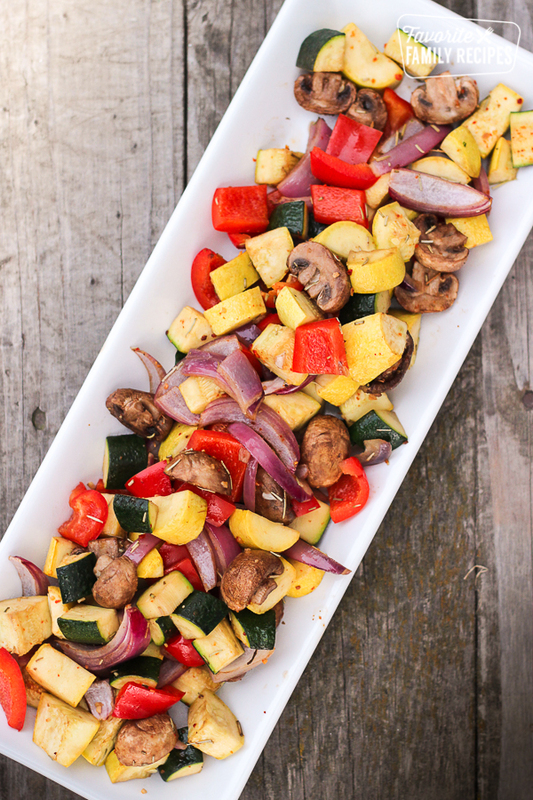 This Oven Roasted Vegetables medley is a colorful complement to beef, chicken, pork, or fish. The idea for this recipe came from the Claim Jumper Restaurant. I ordered their roasted vegetables and loved them so much, I came up with my own version at home. 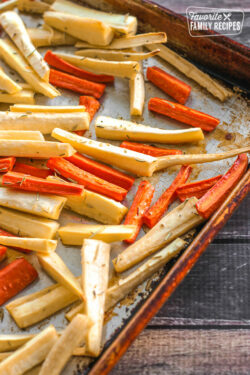 All of my favorite vegetables are included in the Roasted Vegetable Medley recipe. 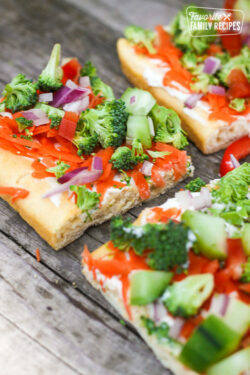 You can add or subtract vegetables to your taste. There are a few vegetables that don’t roast well, in my opinion, like broccoli and green beans, but most vegetables roast beautifully. You can roast broccoli and green beans, they just don’t look as nice when they are served and can get limp and soggy. I’ve included my favorites in this recipe, but you can also roast butternut squash, asparagus, eggplant, cauliflower, and brussels sprouts. What is the Best Temperature for Roasting Vegetables? Roasting vegetables at a high heat causes them to caramelize on the outside without overcooking them on the inside. An oven temperature of 450 is just right. No one likes mushy vegetables! Keep an eye on them in the oven. They are perfect when they are starting to brown a little on the edges. Please be sure to not overload the pan with too many vegetables. They cook more evenly when they are spaced out a bit on the pan. Which Seasonings are Best for Roasted Vegetables? Seasoning the vegetables really brings out the flavor. I am a big fan of rosemary and I always use it when I roast or steam veggies for a side dish. 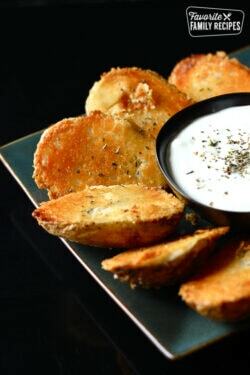 It is also delicious on roasted or steamed potatoes. I like to use a generous amount. 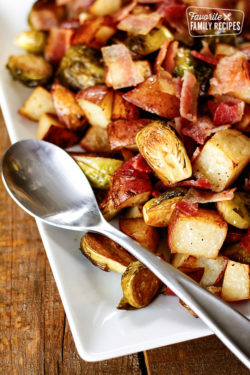 Add the tablespoon it calls for in the recipe, but make sure that every vegetable is covered, adding more if necessary. Rosemary is surprisingly in the mint family of herbs, but I don’t think it is minty at all. It has more of a woodsy, pine flavor to it. It pairs amazingly well with garlic. If you have had a jar of rosemary seasoning sitting in the pantry for a while, you won’t get the full benefit of the flavor. You can refresh it some by crushing it between your hands before adding it to the vegetables. In addition to rosemary, oregano, thyme, parsley, salt, and pepper are delicious on vegetables. 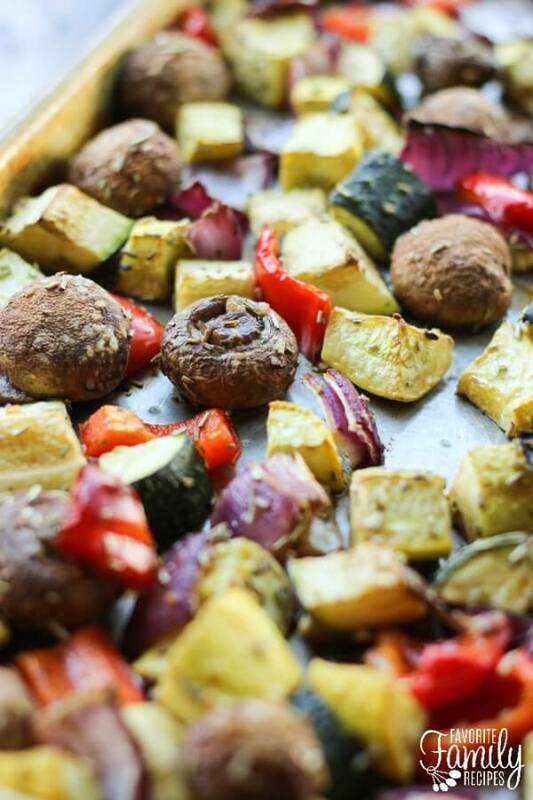 These Roasted Vegetables are a delicious, healthy, and easy side dish. The vegetables have just the right balance of tenderness and crispness. Spray a large baking sheet with cooking spray (or you can foil line the baking sheet and spray the foil). Mix all of the cut up vegetables and garlic in a large bowl. Add olive oil and balsamic vinegar. Toss until all the vegetables are covered. Add rosemary leaves and salt, and toss again. Roast the vegetables for about 30-40 minutes, stirring once. You will know the vegetables are done when they are brown on the outside edges and tender on the inside. I love roasted broccoli!! It’s great, but it wouldn’t be good in this recipe because it cooks much faster than these. Thanks for the idea here. Looks great! Thanks for sharing. About how much does this make? I need to make a half tray for a party and not sure if I should triple this or what. Thanks! It makes enough as a side serving for about 8 people. Good luck with your party! 450 is way to hot. Turned my down to 375. But I think I will just do 350 next time. I don’t like my food incinerated! This was so yummy and good! Can this be placed in a disposable pan and roasted on the grill (I need a very large amount of veggies as a side)? To roast the vegetables on the grill, you will either want to use a grill basket (which probably wouldn’t be big enough if you need a large amount) or foil packets. You can make several foil packets to grill at once. Use heavy duty aluminum foil or 2 layers of regular foil. Tear off a large piece of foil. Use a pastry brush to oil the foil well and then place vegetables in the middle of the foil. Securely fold and seal the packet edges. For the vegetables in this recipe, you will want to grill on medium to medium-high for 10-12 minutes on each side. Every grill is different so you will want to check the vegetables after you turn them so you can adjust the cooking time if necessary. I hope this helps! Good luck! Can this recipe be prepared in advance and get heated later when the company arrives? Yes, it can…but be warned that the vegetables become soft when saved and reheated. They really are best right out of the oven. Thank you for asking! I had a very similar recipe to this in a cafeteria style restaurant once, and LOVED it– just the right amount of tenderness and crispness– fresh-tasting and LIGHT! I can’t wait to try this version, what with the spices and other flavors used!! what about adding eggplant instead of summer squash? Has anyone tried that? I haven’t tried it – but, I think I will. It would work great! Trying this for a holiday party tonight! Yum! I love that you’re eating healthy at a holiday party! Thankfully my husband, children & grandchildren love roasted vegetables. I’m always looking for new ways to change them up, thanks for giving me another way to do that. I thought I’d offer another suggestion. Use a grill pan, basket with the holes or disposable pan with or without holes & add some sun dried tomato salad dressing. I also marinate chicken breast in a bag at least 2-3hrs with the same dressing then grill both. The dressing is amazing on the veggies & the chicken. If you don’t want juice dripping on your grill don’t put the holes in the pan. I’ve done it both ways & it’s so good. Just use less dressing if using a pan without holes. Remove the veggies when they’re as done as you like (we like ours still lil crunchy). Remove the chicken when it’s done & juice runs clears. Thanks again for a new idea. I’m going to try yours in the oven & on the grill. Does your vegetable medley have a slightly sweet taste to it? If so its great. I was hospitalized a few months ago and they had this on the menus, and decided to try it, it was wonderful!!! I have found that roasting broccoli or brussels sprouts (both of which I love) overpowers the other vegetables. Roasting them also brings out a strong cabbage family smell that isn’t nice. I recommend leaving the cabbage family for a different cooking method.